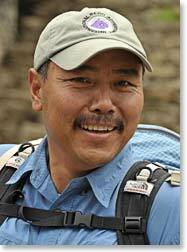 This is Temba writing from Khumjung at 12,600 feet/3,840 metres. We were up early today and began our trek from Namche around 9 am. The weather was beautiful this morning and we could see Everest and other giant mountains on our way to Khunde. We visited the Khunde Hospital which was founded by the Hillary Trust more nearly 50 years ago where Dr. Kami gave us a tour. After our trip to the hospital, we went back to have lunch at my family's house. Then we went to explore the Khumjung Monastery which houses the famous “Yeti Skull”, and then to the Khumjung school which is the first Hillary School, founded in 1961 and is still operating to this day. Everybody did well today. Now it's evening and it is beginning to rain a little bit. 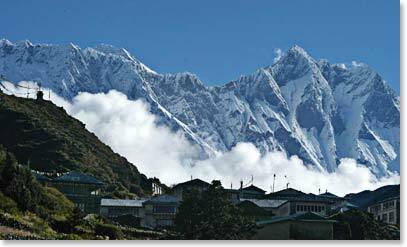 Hopefully we will have clear skies again when we wake up in the morning for our trek to Pangboche. The view of Mount Everest and Lhotse from Ang Temba's house. 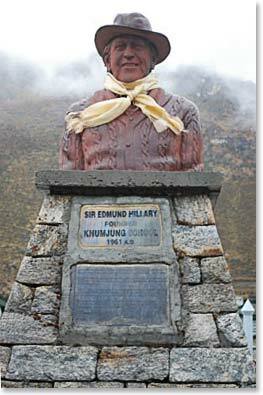 High school excercise training at the Sir Edmund Hillary School in Khumjung.